“Geographers Had Predicted Osama’s Possible Whereabouts” – ScienceInsider*. I had not seen this 2009 paper that is now getting renewed interest with Osama Bin Laden’s discovery and death, which applied biogeographic theories to create a probabilistic spatial model to predict his occurrence. Thomas Gillespie and John Agnew, geography professors at UCLA, and their more enterprising undergraduate students in their remote sensing class asked biogeographic questions in light of available remote sensing data to address the probabilistic occurrence of an individual, instead of a species. Certainly a novel twist to modeling, and with incomplete but public information on their target, they formed a hypothesis. Ultimately their prediction of the terrorist leader hiding in one of several large building compounds in Parachinar in the tribal areas of Pakistan did not make the final test, which became public knowledge yesterday. One may argue about several of their assumptions (such as the distance-decay idea that the further away from his last known location the higher the chance of notice and thus detection; arguably he had cultural roots in more than one culture being Saudi, but perhaps his radical practises would only be less noticeable in extremist-friendly regions?). 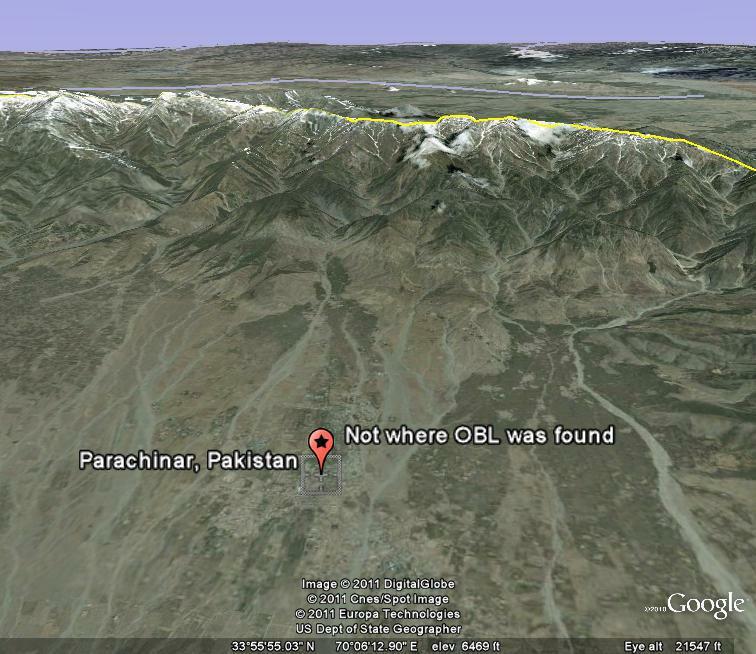 The Google Earth screenshot on the left shows Parachinar, Pakistan, just over the Afghanistan border (it’s on the horizon along the mountains’ tops), which is several 100 kilometers from Abbottabad. Ultimately the practical assumptions of their modeling were borne out (e.g. someone requiring dialysis would be located in a more urban area rather than a remote cave in Afghanistan, etc). But maybe what is most telling here is not about the specifics of predicting Osama Bin Laden, as we assume the CIA would have much more key facts and details to include in a better model, but that we are starting to think and be able to model presence and absence of an individual probabilistically and with actual, easily available data (they used imagery available to anyone with Google Earth and ArcGIS). *Footnote: the article in ScienceInsider does overstate the model’s prediction– talk about a tantalizing title!